As creatives we have the amazing opportunity to get creative with our thankfulness. Creating a gratitude journal is the perfect space to express your gratitude in a crafty way! How to set up a gratitude journal … easy! You may be new to gratitude journalling or are already enjoying the benefits and would like to add some creativity to your thankfulness. Maybe your enjoy doodling, splashing some paint + sticking down some washi or creating digitally. We can use all of our creative skills to enjoy the benefits of cultivating an attitude of gratitude. One of the amazing benefits of gratitude journalling is how much more aware we are of what is happening in our life. I have discovered connections between my thoughts, actions and goals from this simple daily activity. Having a place where we can connect the different pieces of our day is the reason I designed the FUSE:life planner printables. And having a space for creative gratitude, I think, is an essential part of creating a life you love. 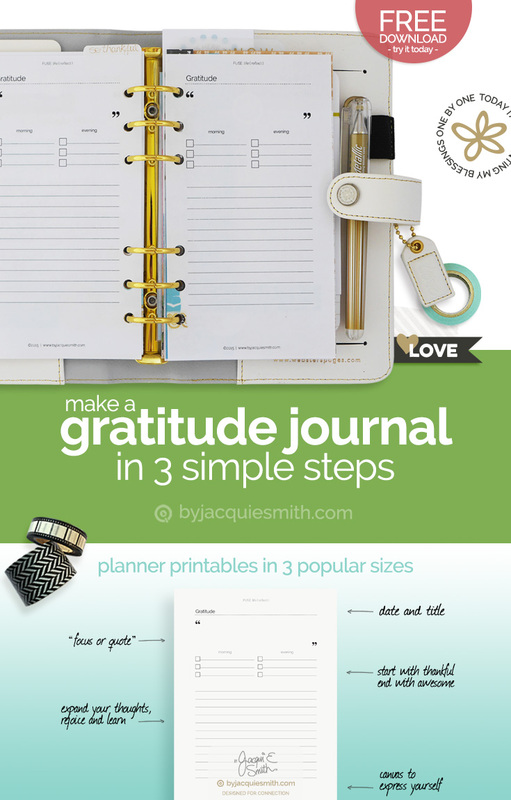 Today we are going to set up our own gratitude journal or should I say, gratitude planner. If you can simply + easily print planner pages you are halfway to counting your blessings and having fun doing it! It’s just another great reason to let the “planner bug” bite! Awesome, I’m so glad you’ve joined us. Whether your planner stays on your desk or travels with you as your constant companion + most loyal assistant, I have a size that will work for you. My FUSE:life digital planner printables come in three popular sizes while the Colour Your 365 printables are available in the large size only. One of the most popular questions I am asked is about planner sizes. You can take a look at them close up and see what sizes work together so you can find the planner binder to match your preferred paper size in my article on planner and paper sizes. You will also find tips on printing the different sizes to make it simple + easy! Now that we have matched our planner + paper sizes we are ready to begin printing. #Tip: Be careful when matching planner and paper sizes. Some companies have different names for their sizes. For example Kikki K call their A5 planner a large size while many other companies call it medium. It’s just the way they named their planner sizes. Always check the dimensions to be sure. Need some assistance, see my article on planner and paper sizes. We will use the FREE FUSE:life Gratitude Personal planner pages you received when subscribing to my newsletter + A4 paper. This fits my favourite, aqua and white stripe, Personal Websters Pages : Color Crush (95x172mm) planner binder (pictured above). In the FREE printable gratitude planner page download you will find both a single and 2up page option, with trim marks. # Tip: Don’t feel like you have to print a whole years worth of pages. Having the freedom to explore and learn what works best for you is one of the best things about creating your own planner. You can always print more as needed. With your planner + paper size chosen, let’s print the first side of your planner pages. As I am printing the Personal size pages on A4 paper I will be using the 2up option of the Gratitude page. Let’s start with enough pages for about a fortnight. Once you see the flow of how to print your planner pages, you simply repeat these steps to print more pages as required. Now that you have the first side of our pages printed, you are ready to print on the reverse side. The secret to getting this right is in knowing how your printer works. You either flip or flip + turn your printed pages over to print on the reverse side successfully. #Tip: To work this out, check out my Tips for Printing Planner Pages article. With your pdf file still open, let’s print the reverse side of the gratitude pages. Trim your pages if needed, assemble your pages in a neat stack, hole punch + insert into your favourite binder. Now that you know how to print your gratitude pages you are ready to add some creativity to your thankfulness!